Well, it's all built and now let the quilting begin! I've only owned my sewing machine for a year (a little less, actually!) 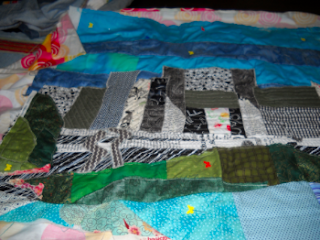 so the chance to do some really custom quilting, given the small size of this project, was an absolute delight for me! I knew that I wanted to really delineate each building, really make each individual building pop from the one next to it, so I did a LOT of pivoting and quilted straight lines on each building, but quilted vertical in some, horizontal in others, and diagonal on still others (and changing the direction of the diagonal, too!). I started at the left edge and just slowly pivoted my way from one edge to the other, lots of slow sewing, stop, pivot; sew, stop, pivot; and sew on...! 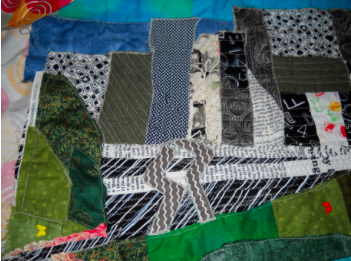 I added a straight across zig-zag stitch in the road section, and I love how it turned out. I left the SP (the actual inspiration part) bare, as a bit of trapunto (remember, it has an extra layer of batting) to help it really pop. Now I have some ideas for the background bits, so off to work on that. I think I'll follow the contour of the hills, but still thinking of what to do with the water. Maybe a decorative stitch to resemble waves? We shall see! I do like how it turned out. I like hearing about quilting decisions because it is an area where I have a lot of learning to do. thanks :) I am such a newbie, it helps me to talk through what I did and to read what other people say about why they did it that way.